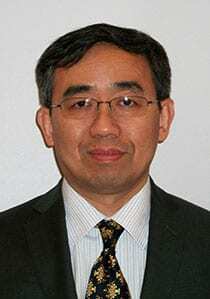 Yong Zhao M.D., Ph.D., is an Associate Member of the Center for Discovery and Innovation. Abnormalities in multiple immune cells and the deficit of insulin-producing cells are two crucial common issues in type 1 diabetes (T1D) and T2D. Insulin therapy is not a cure. In search of a cure for T1D, Dr. Zhao discovered cord blood-derived multipotent stem cells (CB-SC) in 2005 and successfully translated this finding into clinical use. Dr. Zhao and his colleagues invented Stem Cell Educator therapy for the treatment of diabetes and other autoimmune diseases in humans. Stem Cell Educator therapy is a closed-loop system that circulates the patient’s immune cells, briefly cocultures them with adherent CB-SCs in vitro, and returns only the “educated” autologous immune cells into the patient’s circulation. This groundbreaking T1D study was recognized by the American Diabetes Association at the 72nd Scientific Sessions in Philadelphia in 2012 as one of eight major diabetes breakthroughs that year. Recently, four-year follow-up studies demonstrated the long-term safety and clinical efficacy of Stem Cell Educator therapy for the treatment of T1D and T2D. Currently, they are exploring the molecular and cellular mechanisms underlying Stem Cell Educator therapy to improve its clinical efficacy for the treatment of diabetes and other autoimmune diseases.